The race to become the most popular e-reading in the United States is down to Apple's iPad and Amazon's Kindle, according to a recent survey of 2,800 e-reader users by ChangeWave Research. ChangeWave found that Kindle's market share dropped in November by 15 percentage points to 47 per cent of the market compared with the results from a survey ChangeWave conducted in August. Apple's iPad, meanwhile, has jumped by 16 points to take up 32 per cent of the market. 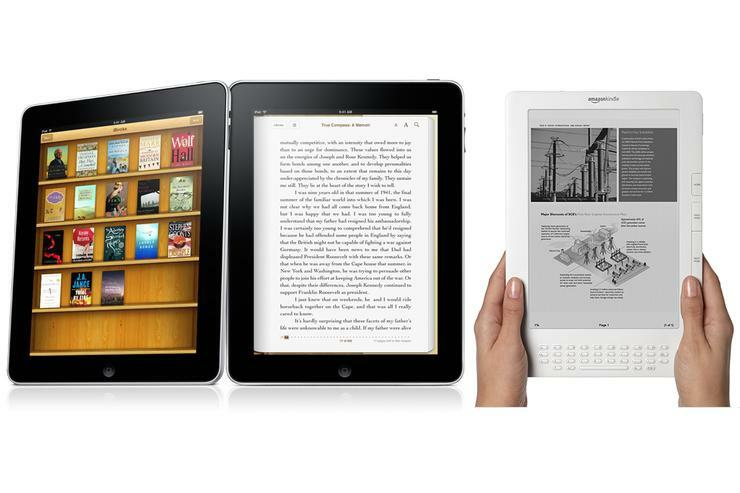 The Kindle and iPad were followed by Sony's Reader at five per cent and Barnes & Noble's Nook with four per cent. It's not clear which devices make up the missing 12 per cent of the US market. ChangeWave's results are interesting and show that the iPad is a very popular gadget, but the findings aren't all they're cracked up to be. Let's take a look. Readers love their Kindle device, according to ChangeWave, but they love their iPad even more. ChangeWave found that 75 per cent of those surveyed said they were very satisfied with their iPad as an e-reader compared with 54 per cent of Kindle device users. Interestingly, the Kindle performed better with the wishy-washy crowd, with 38 per cent of respondents saying they were somewhat satisfied with the Kindle compared with 21 per cent with the iPad. On the iPad you can read books, newspapers and magazines in specially designed third-party apps such as Conde Nast's GQ magazine app or Virgin's recently launched iPad magazine Project . You can also read similar content on the Kindle, but in grayscale and with limited interactivity. So it's no surprise that when it comes to content, the iPad is king, with 76 per cent reading books on the iPad, 51 per cent reading newspapers on the device, 36 per cent reading magazines and 45 per cent reading blogs and newsfeeds. Unsurprisingly, Kindle owners use the device mostly to read books, a full 93 per cent of them. Just 11 per cent read newspapers on the device, eight per cent read magazines offered on the Kindle and only three per cent read blogs or RSS feeds on the Kindle. ChangeWave's findings show there's no question the iPad is a very popular device for reading. As more companies experiment with producing content for the device -- such as the aforementioned Project magazine or News Corp's upcoming daily newspaper for the iPad -- reading on the iPad is set to grow even more. But one thing ChangeWave neglected to look into, or at least mention, is which apps people are using to read on the iPad. I have to wonder how many of the 76 per cent of iPad book readers are using the Kindle iPad application instead of Apple's iBooks app. Unlike iBooks, Kindle isn't just a device but a platform. You can read Kindle books on any number of devices including personal computers, as well as Android, iPhone, iPad, iPod Touch and BlackBerry devices. Apple's iBooks, on the other hand, is only available on the iPhone, iPad or iPod Touch. The iPad as a device may soon be more popular for reading than the Kindle device, but does that really matter to Amazon? Isn't the Kindle just a way to get more people reading books? As long as they're buying their e-books from Amazon and not iBooks, it doesn't really matter to Amazon which device they're using. Amazingly, however, the Kindle is still going strong despite the iPad's popularity. Amazon routinely says the Kindle is its best-selling device, and ChangeWave found that 33 per cent of people looking for a new e-reader in the next 90 days plan on buying the Kindle, while 42 per cent plan on going with the iPad. But will the new iPad owners be reading on a Kindle or iBooks app? That's the real question.